I saw lot of topics with the same title but answers are different. I have a magnetometer in my phone which give me the components of magnetic field in direction of X, Y, Z. If my phone lays on a table the 'z' axis points up. (see the picture below). The values of magnetometer are: ~15 microT in X direction, ~8 microT in Y direction and ~-55 microT in Z direction. Which of the following angles can be determined using datas of magnetometer? Roll, pitch, yaw? And how? Usually the magnetometer is used to find the yaw. It acts as a digital compass in this case. 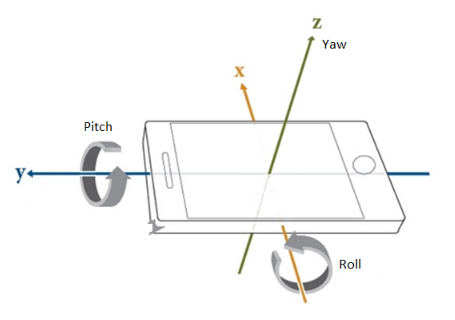 To calculate roll and pitch you need an accelerometer. But there are some techniques that can be used to calculate the roll and pitch using the magnetometer. For that you need to place a magnet close to the mobile phone and observe the sensor values. Using these values you can calculate the roll and pitch with respect to the position of the magnet. You may find the necessary equations from the following link. Not the answer you're looking for? Browse other questions tagged magnetometer orientation estimation or ask your own question. Is there a way to measure 3 axis orientation without a magnetometer?